On 26th September 2016, a Bristol Civic Society Blue Plaque to honour a World War II codebreaker was placed on St Mary’s Church, Fishponds. Gordon Welchman worked on signals intelligence with Alan Turing at Bletchley Park, analysing German military messages. His work formed the basis for what is known today as meta-data analysis. Under Gordon’s direction, codebreaking evolved from a linguistic base to one based on mathematics. 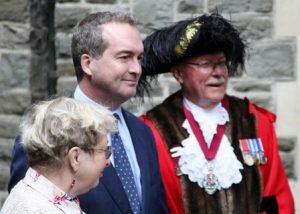 More than 60 attended the unveiling including Lizzie Kesteven, Priest in Charge at St Mary’s; Chris Davis, Deputy Lord Mayor; GCHQ Director Robert Hannigan and Gordon’s daughter, Susanna Griffith. GCHQ staff brought a German Enigma cipher machine and as part of its schools outreach programme they hosted a code-breaking workshop for students from nearby Fishponds Academy. The plaque was supported and paid for by the Greater Fishponds Neighbourhood Partnership. It will foster community interest in a worthy past resident of Fishponds. The work of Gordon Welchman was so secret that he received no recognition for many years. His traffic analysis technique has endured – it helped in the hunt for Bin Laden.